Blurb: Seventeen-year-old Vivian Apple has just travelled across the country, fended off roving bands of indoctrinated teenagers, re-evaluated everything she ever thought was true, and uncovered the dark secrets about the recent so-called 'Rapture' and the Church of America. And now, she must rescue her maybe-boyfriend Peter from the Church before the world is (supposedly) due to end, which is in less than three months. It's been a busy apocalypse so far. 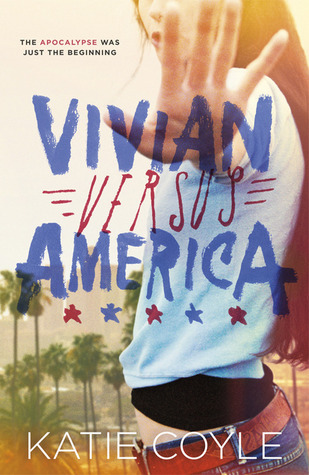 Vivian Vs America is the sequel to Vivian Vs the Apocalypse, and it takes place right after the first one ends. Literally , right after, there is about 15 seconds between the end of the first book and the start of the second. Really it could have been one reasonably large book instead of two shortish ones, but it also works really well this way. Vivian’s story definitely follows two distinct arcs, and while I loved these books and I secretly wish there could be a third, I know that would be unnecessary and I would probably just give out about it. I feel like a lot of YA authors are pressured into drawing the stories out in order to fill a trilogy, and I’m glad Coyle wasn’t, because it worked a lot better as two books. Book one doesn’t have a review because I read it when I was supposed to be preparing for an interview ( which , if you’re interested, I didn’t get, darn you Katie Coyle !!!) and really didn’t have the time. But if I had written the review I would have given it four to four and a half stars, and Coyle definitely keeps up this standard in the second book. One of my favourite things about this book is it if filled with strong female characters. Not ridiculous Lara Croft style ones, they reminded me more of the female characters in Harry Potter. Vivian is a fantastic protagonist , though she is fallible and sometimes makes mistakes, she has a good head on her shoulders and she always tries to do what is best. She is a perfect contrast to her best friend and partner in crime Harp, who is loud, overly confident and extremely eloquent and humourous. But the best thing about Viv and Harp is the support and loyalty they have for one another, they really do have a true friendship and they make a fantastic team. On the other hand, as great as Viv’s relationship is with Harp, her relationship with her mother Mara and her half sister, Winnie is a weird one. It is strained at first, but over the course of the narrative we see it strengthen and develop. Vivian is one of two books I’ve ever read that explores the idea of religion ( the other being The Life of Pi ). It’s a charged subject, one that few authors, especially YA ones, are willing to take on. Coyle presents religion as neither a bad nor a good thing, but it has the potential to cause harm, but also bring hope and comfort, depending on the intentions of those wielding the power. She also highlights how desperation and fear can cause people to do some terrible things. The whole book is also a damning indictment of the consumerist culture in the west, and she’s pretty much spot on with the whole thing. The angels use the apocalypse as a way to make money, so obviously once the rapture day comes and no one is raptured people are going to be suspicious. The plan that the Angels come up with to keep the apocalypse going is pretty clever, but their barefaced cheek is kind of unbelievable. Throughout the novel, we see Vivian and Amanda clash heads over the issue of using violence to achieve their aims. Amanda is ruthless and she talks about sacrificing the lives of her militia in an offhand way, while Vivian is very apprehensive about the whole thing. She would much rather try to take down the church of America as peacefully as possible. I agree with Vivian, and this is where my love for Edie ties in . Edie is the most peaceful and thoughtful yet sharp witted character I have read about in a long time. She is so full of love and hope and is the perfect contrast to the Church of America. The only thing that annoyed me about the book was Viv and Peter’s relationship. Now don’t get me wrong, I love Peter and the two of the are super cute together, but that’s kind of the point. It kind of annoys me when girls in dystopian novels get distracted by romance, because realistically if we were actually in that situation, you would be too scared to think about anything but survival. Also Vivian makes an insane out-of-character mistake that also functions as a major plot hole. Overall I absolutely loved this book, it was a perfect conclusion to the story and I simply couldn’t put it down.